“The housing market shows imbalances, with double-digit price gains as the urban population outpaces construction, pushing up household debt from already high levels. Dwelling price rises accelerated to 16 percent y/y in September, led by apartment price increases exceeding 20 percent in Stockholm and Gothenburg. Housing supply is constrained by construction impediments and rent controls while demand is bolstered by population growth and urbanization, rising income and financial savings, and historically low interest rates. 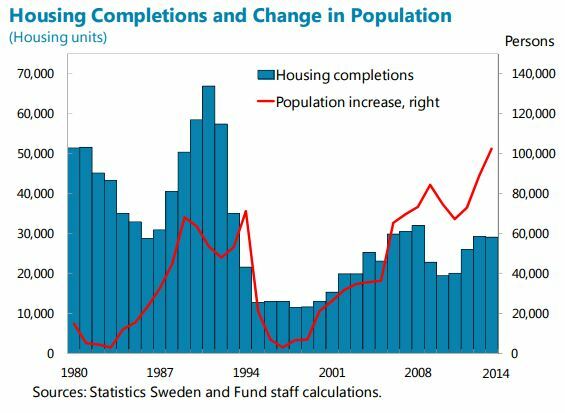 Households need to borrow more at higher house prices, with mortgage credit growth of 8 percent y/y in September lifting household debt to 176 percent of disposable income (195 percent including housing associations)”, according to the IMF new report on Sweden. A separate IMF report looks at the role of supply constraints in driving prices of owner-occupied housing using municipal-level data.